Comprehensive review of Estee Lauder Bronze Goddess Self Tan. See what the experts and actual users have to say about this self tanning product. Overall we like Estee Lauder Bronze Goddess Self Tan. It has a nice, light feel to it, smells great and produces a nice, medium-colored shade of bronze. The only negative we see is how it tends to be a little splotchy and streaky as it wears off after about 4 days. But other than that, this is a self tanner that will work well for many people. Estee Lauder Bronze Goddess Self Tan cones out of the bottle as a very light tan-colored lotion. It feels very lightweight. Applying this product is pretty easy compared to many other self tanners. We like the fact that it’s more of a light lotion versus being very thick. That makes it feel much better once you’ve covered your entire body in the stuff. We’re not big fans of those very ‘heavy’ self tanners that make you feel like your skin is being insulated! Estee Lauder Bronze Goddess Self Tan also has a slight tint to it so you can see where you’re putting it on. 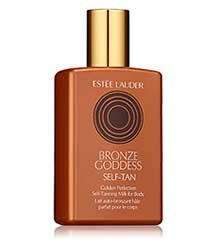 Estee Lauder Bronze Goddess Self Tan dries quickly for a lotion-type product. The fact that it’s light and non-greasy helps speed drying time. Another thing we like about this product is once it dries, you don’t have to worry about getting it on your sheets. That’s pretty rare for a self tanning lotion that has tint. This product has a very floral, very noticeable smell to it. We actually like it quite a bit, but I’m sure they’re people out here who’ll think it’s too much. If you check out the ingredients, you’ll see many plant and flower extracts. That’s what gives it it’s luxurious smell. A special note for the guys out there– you probably won’t want to use this one as the smell is a little too ‘girly’! Once this product has had some time to do it’s thing, in our opinion it continues to smell nice. In fact, it’s one of the better smelling self tanners once it’s had a chance to dry and tan your skin. The color produced by Estee Lauder Bronze Goddess Self Tan is good, especially if you’re looking for a medium-colored tan. If you’re looking for a super-dark result, this product probably won’t get you there. But overall, the color was a nice shade of bronze, with very little streaking or blotchiness. The color we got from this product lasted about 3-4 days, which is just ok compared to most self tanners. One thing we didn’t like was how this product wore off. It was a little patchy and streaky after about 4 days. This accounts for why we don’t have this product ranked higher. Probably not. The smell is very floral and girly. There are more ‘manly’ self tanners out there for sure. Estee Lauder Bronze Goddess Self Tan costs about $28 for a 5 ounce bottle. That works out to $5.60 per ounce, which isn’t cheap. It’s not the most expensive out there by any means, but it’s definitely on the high side. To buy Estee Lauder Bronze Goddess Self Tan, click here. OK For Men? Look elsewhere. It smells way too girly and floral for most guys.